Susie Harrington teaches meditation nationwide and is the guiding teacher for Desert Dharma, which serves many communities in the Southwest near her home in Moab, Utah. She has trained in the Insight tradition since 1989, practicing primarily with Guy Armstrong, Jack Kornfield, and Joseph Goldstein. 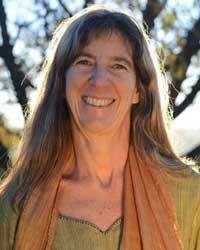 Susie has also received teachings from many others, including Tory Capron, Adyashanti, and Tsoknyi Rinpoche. She was invited to begin teaching in 2005, and often offers retreats outside, believing nature to be a profound teacher, and a gateway to our true nature. Her teaching is deeply grounded in the body and often emphasizes the expression of mindfulness in speech and daily life. Susie brings the skills of inquiry, relational dharma, and the psychological/spiritual interface to her teachings, informed by her ongoing study of the Diamond Approach by A.H.Almaas and as a graduate of Hakomi Therapy (a somatic psychotherapy modality). She offers a two-year intensive program, Dharma in Daily Life, where she delights in mentoring the innate qualities of heart and wisdom in everyday practice. Her practice is rooted in periods of long retreat both indoors and outdoors, which offer nourishment and inspiration for her teaching. She was an outdoor professional for over 30 years, including years as a river guide, mountaineering guide, and backcountry ranger, and now finds her greatest delight in sharing her love of the Dharma and the natural world. Susie completed the SRMC/IMS/IRC 4-year Teacher Training in 2016. For more information, visit www.desertdharma.org.